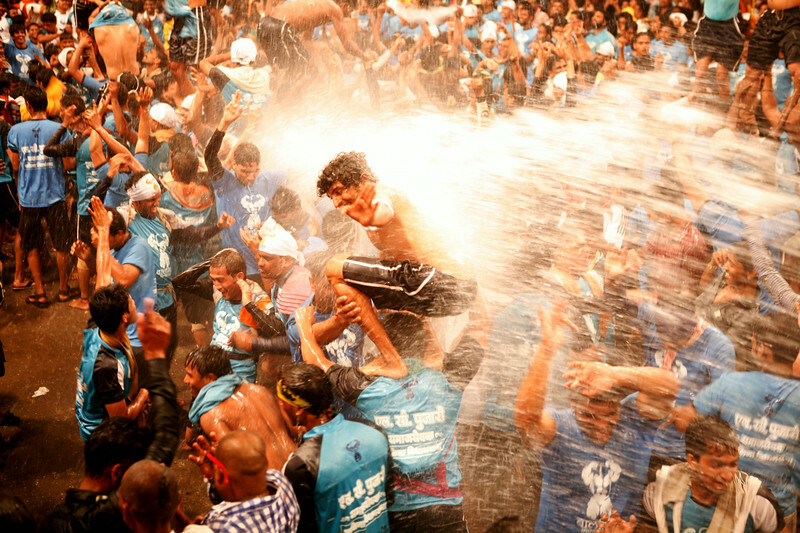 Neighbourhood communities shower water and water balloons on the Govinda Pathaks as they attempt breaking the coveted yogurt bowl on the occasion of Dahi Handi, the festival of Janmashtami, a celebration of Lord Krishna's birthday in Mumbai, India. 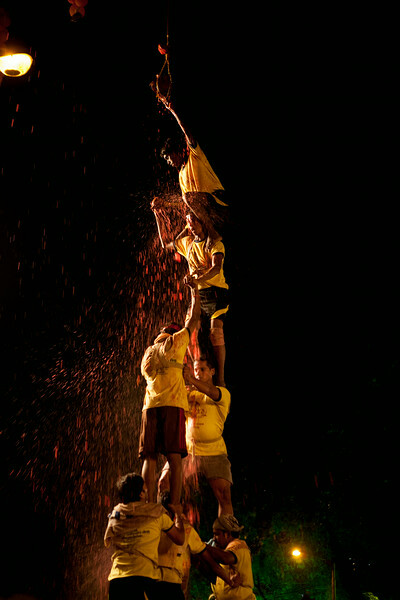 Water shower in the instant reward for the Govindas after successfully forming the human pyramids. 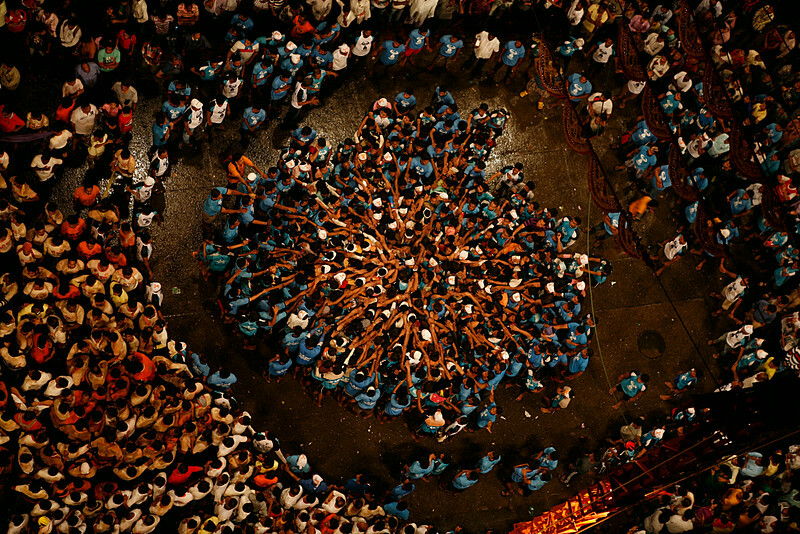 Read the full story of Janmashtami celebrations in Mumbai. 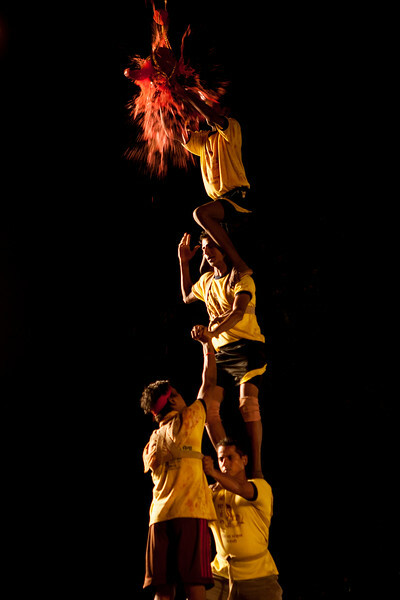 The Govinda Pathaks, as these groups are called, have an in house coach who helps them strategize the formation of the human pyramid. 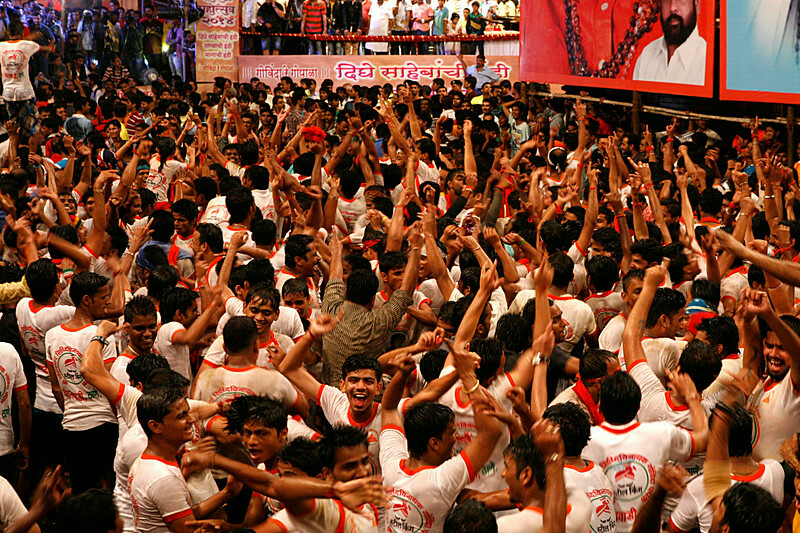 Read the full story of Janmashtami celebrations in Mumbai. This is what it's all about. 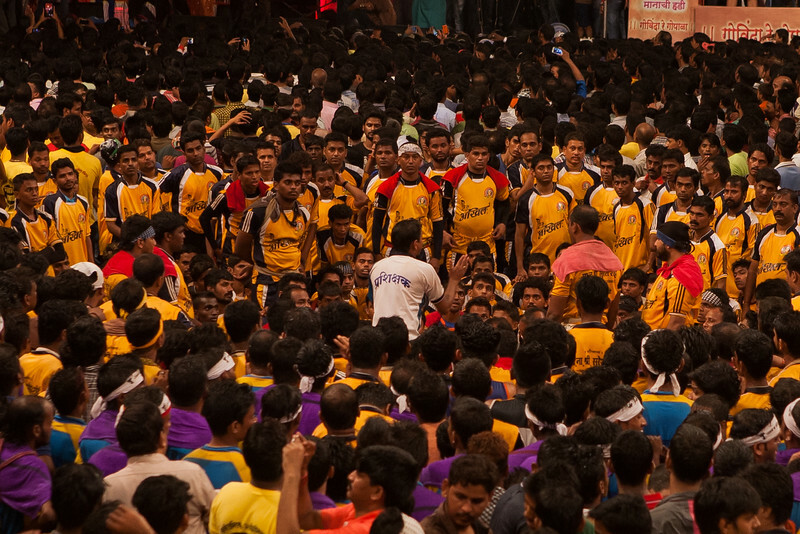 Dare devils called Govindas form precariously balanced human pyramids in an attempt to reach the coveted Dahi Handi. 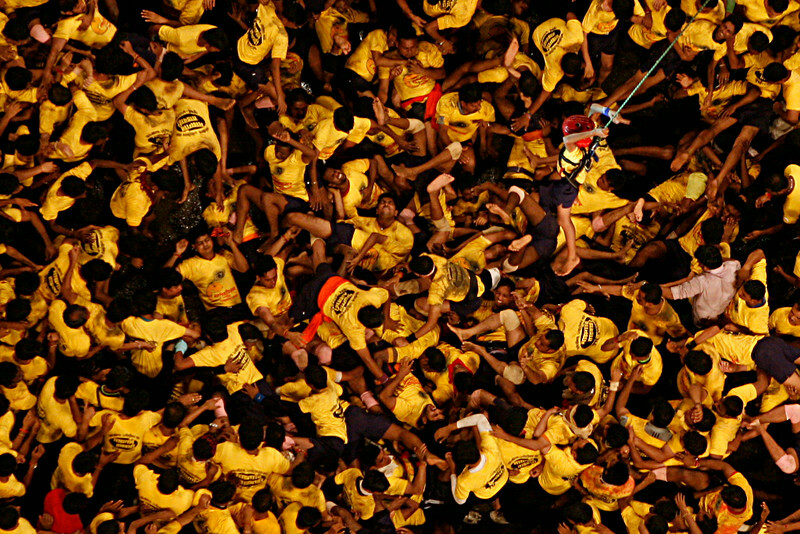 Read the full story of Janmashtami celebrations in Mumbai. They are a labour of love, these human pyramids! 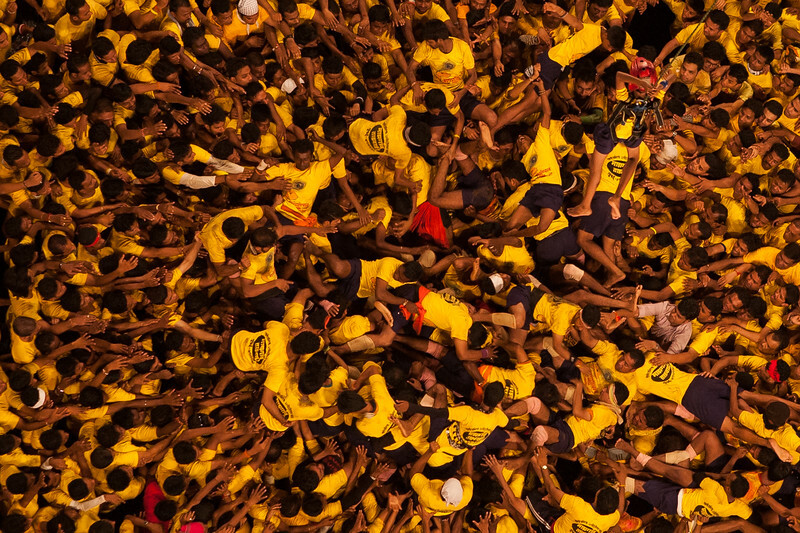 Read the full story of Janmashtami celebrations in Mumbai. 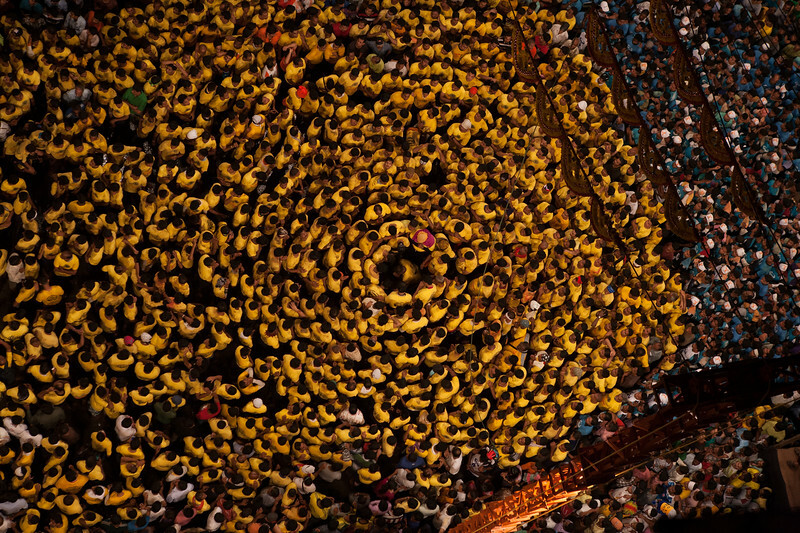 This is what a fully formed pyramid looks like from high above. 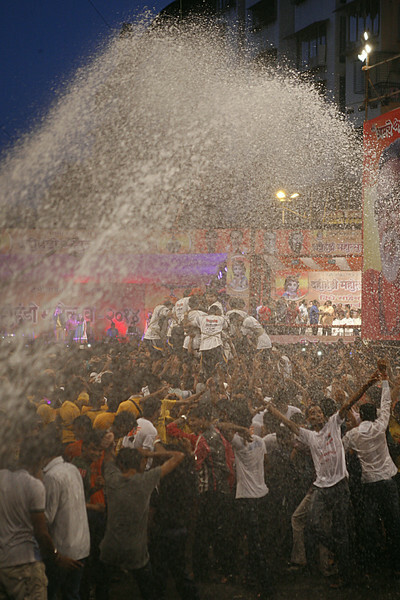 Read the full story of Janmashtami celebrations in Mumbai. The tumble is hard and dangerous. The climb to the top is an act of synchronised skill. But there is no rhyme or rhythm in the fall. 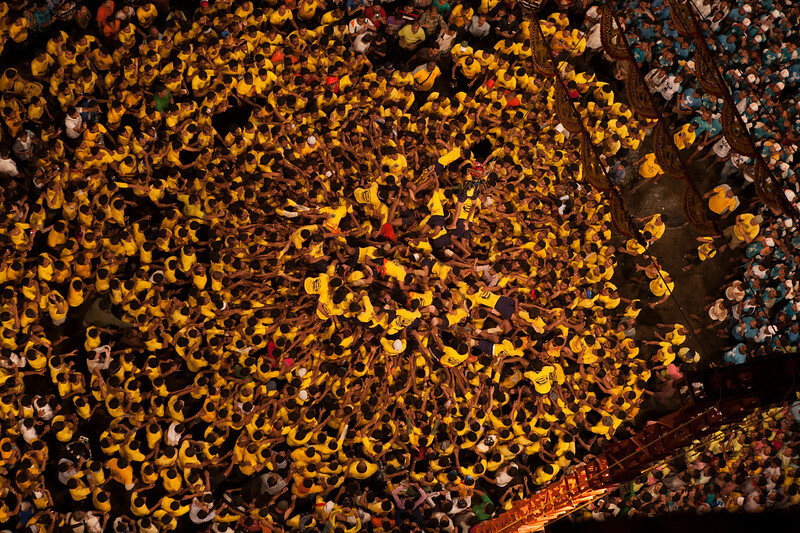 Read the full story of Janmashtami celebrations in Mumbai. 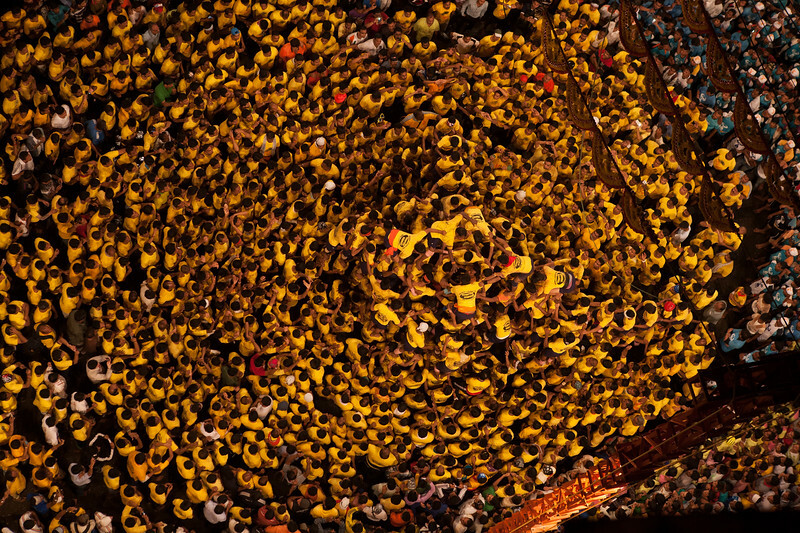 All the members of the Govinda pathak get to the centre to start the formation of the pyramid. 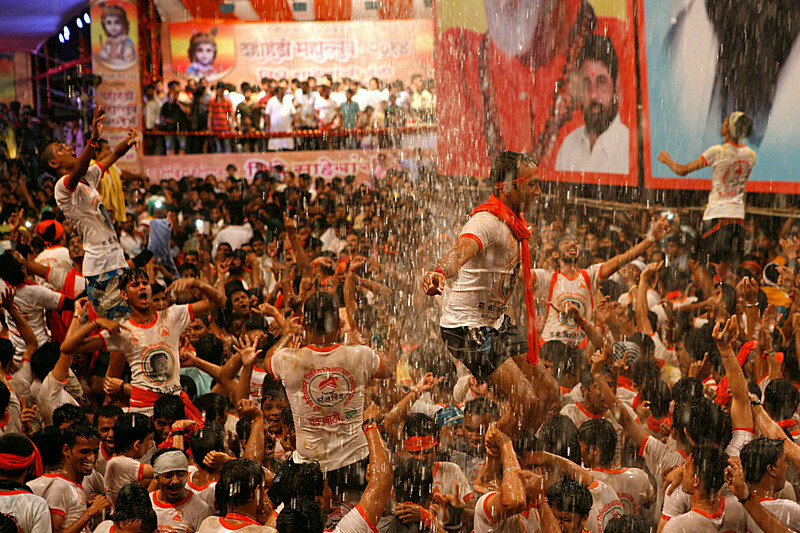 Read the full story of Janmashtami celebrations in Mumbai. This is a ritual followed by every group, a vow before the action. 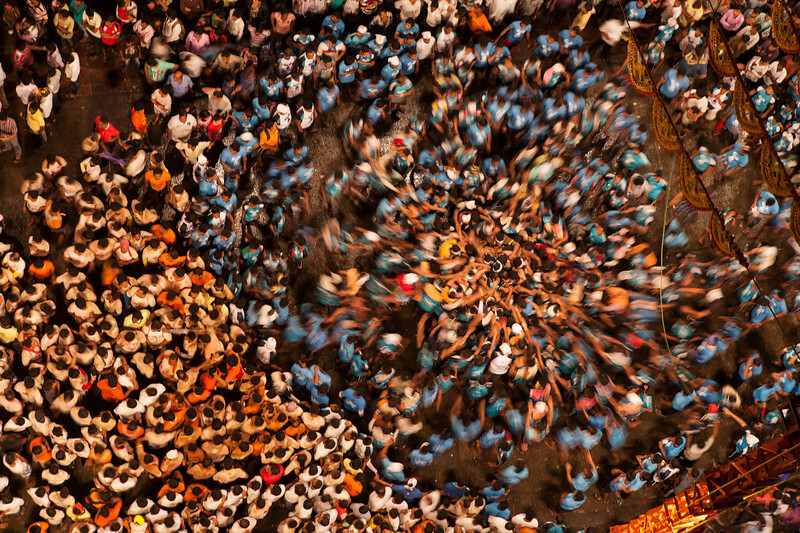 Read the full story of Janmashtami celebrations in Mumbai. 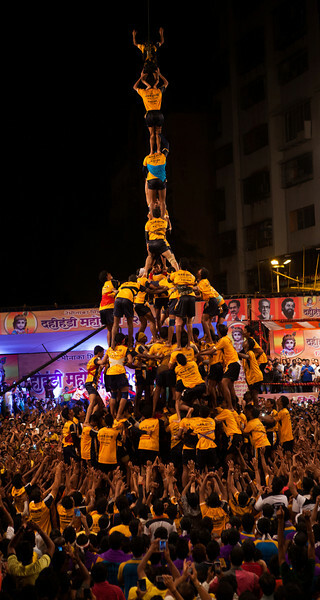 The brave, strong daredevils who provide the base on the ground for the pyramid to rise break into a well deserved dance after the success of forming a 8 layered human pyramid. 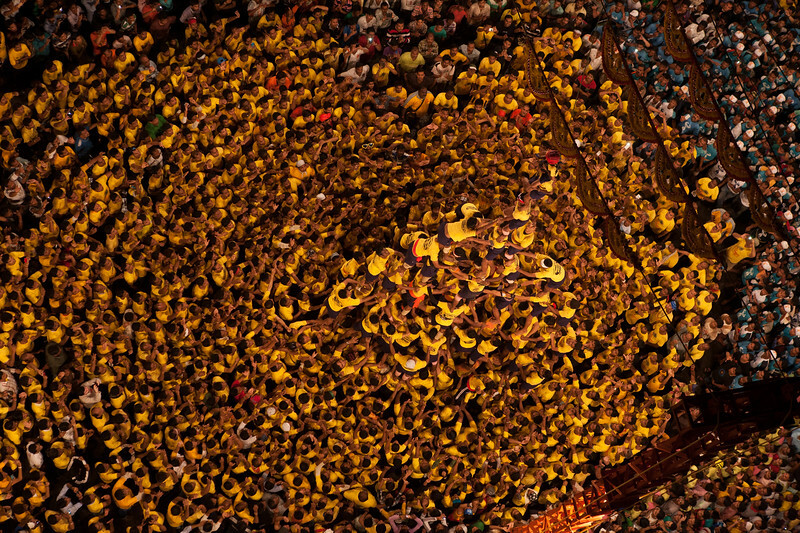 Read the full story of Janmashtami celebrations in Mumbai. The celebrations by the Govindas after successfully forming the pyramids and getting safely back on the ground are a sight in itself! 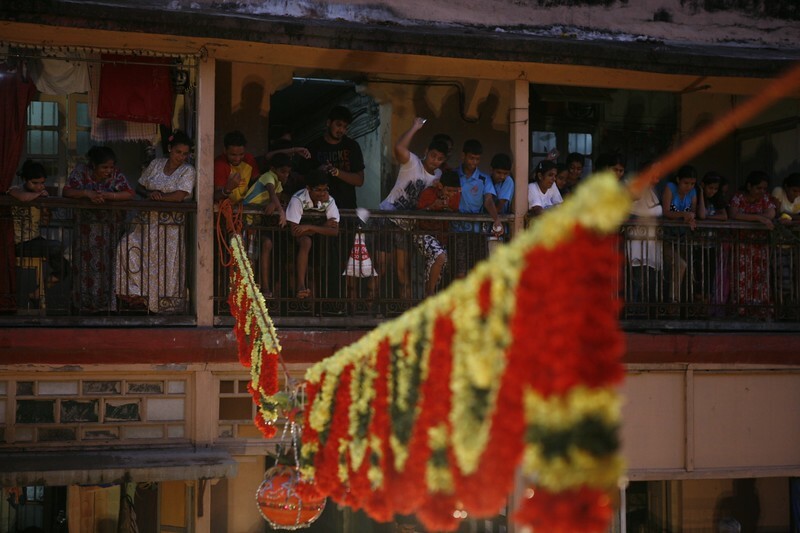 Read the full story of Janmashtami celebrations in Mumbai.